We made another safari in Old Nagzira next morning . Mr. Dhanraj was our guide. We explored other parts of the forest which we could not cover in our first safari. 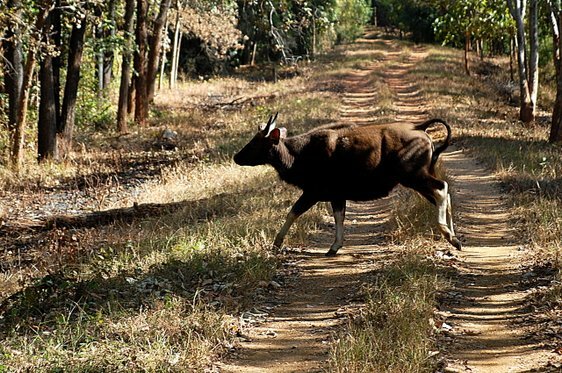 There are two beautiful stretches in Old Nagzira , Gaur Gali (Bison Road) & Tiger Trail . 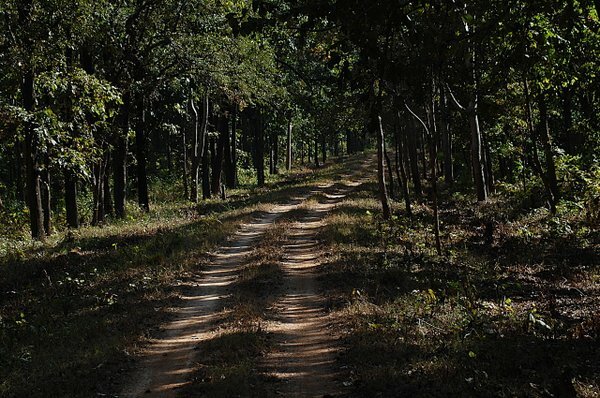 We made safaris through these roads & could spot a few Sambar Deer , Langurs & a Neel-Gai. Chances of animal sighting are less in the Morning . But many birds like Gray Headed Fish Eagle , Indian Roller, Hornbill , Yellow Footed Green Pigeon, River Lapwing, Woodpecker, Orange Headed Thrush , Tree Pie, Kingfishers , Parakeets & an Owlet were spotted in our morning safari . 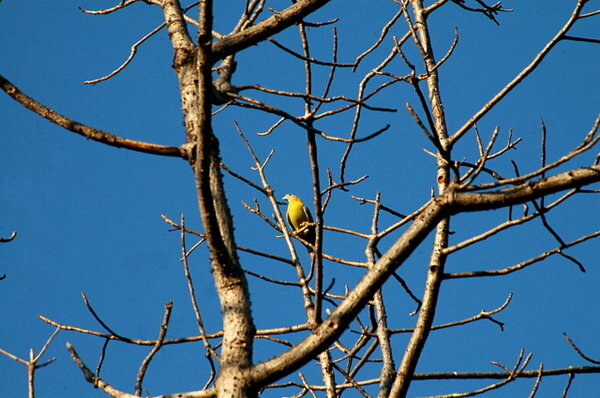 This forest is really a paradise for bird watchers. In yesterday's safari we could not manage to visit the Nagzira Lake. So this time we all decided to spent some time around the lake situated in the heart of Old Nagzira. Every Gypsy entering Old Nagzira has to come to this point for rechecking & and enrolling the Vehicle No again. All the four roads meet at this point. So this point is also called as " Chaukashi" . Nagzira lake is only 100 Meters away from here & we reached the bank of the lake after a couple of minutes of walking from Chaukashi (Walking is allowed in this area only up to the Lake). 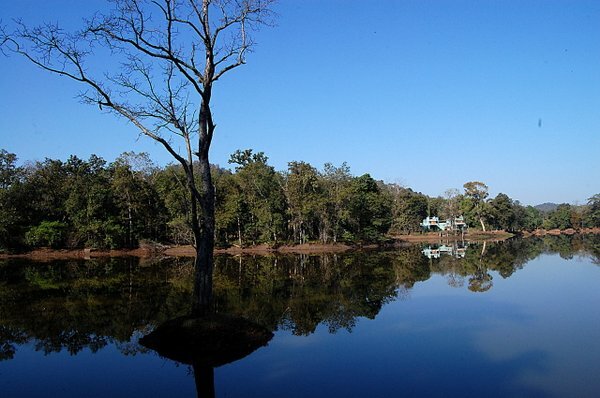 Forest Rest Houses Latakunj & Madhukunj are also situated in this Chaukashi area next to the lake. One can book these accommodations through online portal of Maharashtra Govt : http://mahaecotourism.gov.in. Here are a few photos from our morning safari .. 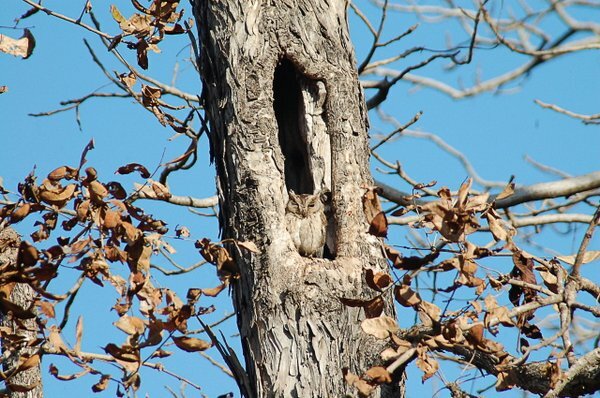 The camouflaging Owl in the last photo of this post was brilliantly spotted by our Gypsy driver Sachin , a nice & energetic young guy from Chorkhamara. I love the owl too! Great report and photos AG. We made our last safari in New Nagzira. 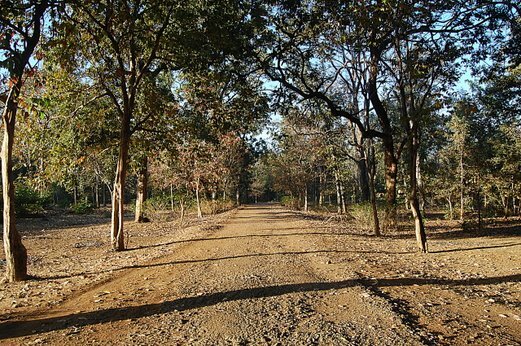 This is a new zone ( Zone III ) having an area of around 150 Sq Kms added to the National Park in the year 2012 to increase the area of the Tiger Reserve. . We had Mukesh as our guide in this evening safari . Since New Nagzira is a new zone, animals are very shy in this part of the National Park. 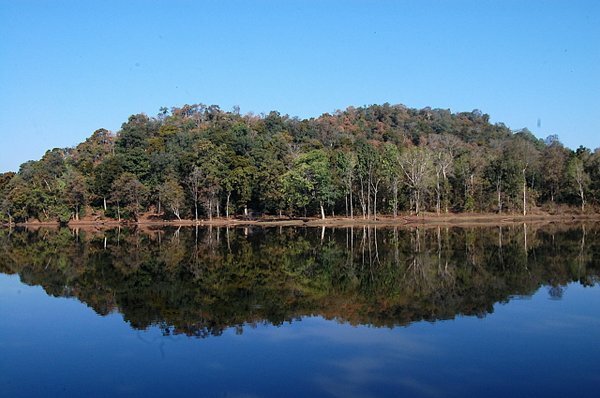 But the forest of New Nagzira , specially the Ghat Section area of it, offers spectacular landscapes & from Chandi-tibba Watchtower (at a height of 1300 Ft) one can have magnificent bird's eye view of the entire Nagzira National Park spreading over an area of around 300 Sq Kms. 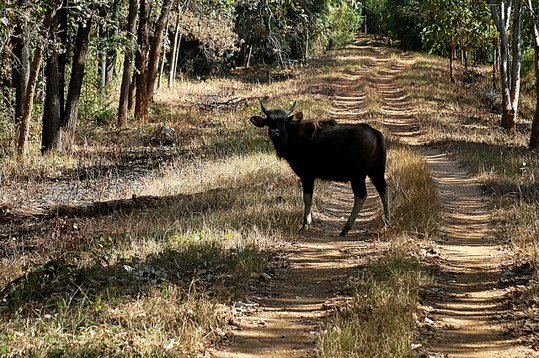 Just after entering New Nagzira we got our first sighting ; three Bison crossed the road from New Nagzira side & moved into the forest of Old Nagzira . The density & the beauty of the forest made us speechless . After twenty minutes of driving at a slow pace we reached the Check-post on Sakoli-Tirora highway passing through the National Park . 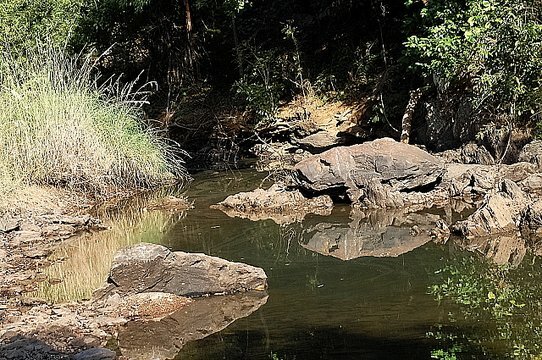 We crossed the highway to enter the Kamkazari area of New Nagzira and gradually moved towards the denser part of the forest with several small natural water bodies on both sides of the road.. After a while ghat section started & within another half an hour we reached the Chandi Tibba Watchtower. The gorgeous view of the National Park from the top is really unforgettable. It was already late evening and we were returning back through Kamkazari area . There was almost no light left for the day. Suddenly our guide Mukesh told , " Look, there is a Leopard ." Sachin slowed down the pace of the Gypsy at once. We saw the elusive animal for the 2nd time in Nagzira. 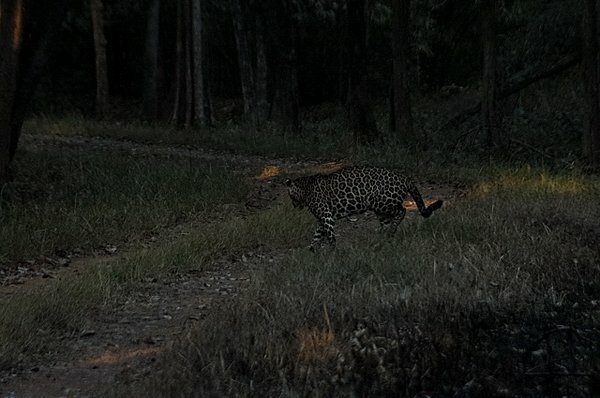 The leopard was walking slowly through the right side of the road . Sachin stopped the Gypsy as the animal was just 50 Feet away . A thrilling moment, no doubt .. .. The leopard turned back , saw the Gypsy & slowly moved deep inside the forest . Our safari almost came to an end. 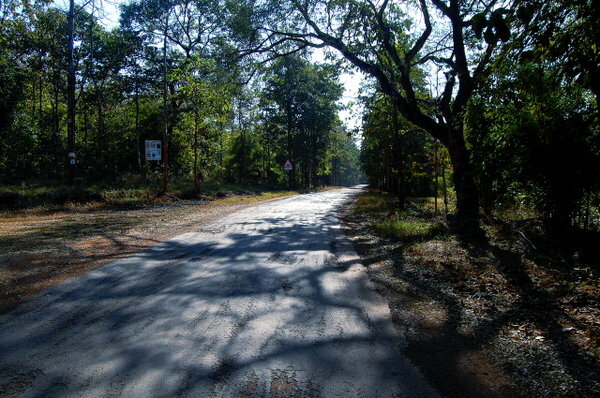 While returning Sachin took the Sakoli-Tirora Highway & we reached our resort at Chorkhamara around 6.30 p.m. The bird you liked in blue background is "Yellow Footed Green Pigeon" , the state bird of Maharashtra . I've met this bird for the first time in our Nagzira Trip. A. Park remains closed from 16th June to 30th Sep .
B. 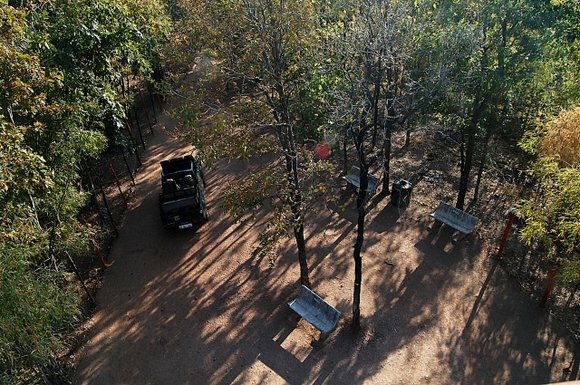 Park remains closed on every Thursday during Oct 1st – June 15th. C.Nearest railway station to Chorkhamara Gate is Gondia (47 Kms) & for Pittejhari Gate nearest town is Sakoli (20 Km) on NH6 ( Kolkata-Mumbai National Highway). 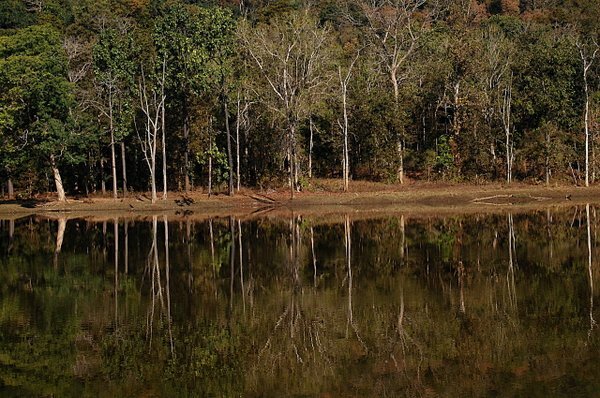 D. Accommodation : There are Forest Rest Houses inside the Park ( Latakunj, Madhukunj , Log Hut etc) near the Nagzira Lake. One can book these accommodation through : http://mahaecotourism.gov.in. We stayed at Nagzira Tiger Resort , a small but nicely located resort just outside Chorkhamara Gate (only 100 Meters away from the Gate) . The resort has both AC & Non AC rooms (spacious & attched bath with geyser). All the staffs are very cooperative & quick at service. We had spotted many birds from the resort compound also. Ther resort Owner Mr. Sudhakar Dahekar is nice person & he also arranges Gypsys & entry permits for his guests . Contact No : 09673387561 . Website : http://nagziratigerresort.org. E. Safari Timing : Daily Two Safaris ; Morning Safari – from 6.30 am to 11 am & evening Safari – From 2.30 pm to 6 pm. F. Safari Charges : Vehicle Entry Charge – Rs 150, Guide Charge – Rs 100 , Per Head Entry Fee- Rs 50, Per Camera – Rs 100, Gypsy Charge ( Per Safari ) - Rs 1700.